A new movie is set to release the first week of March, and I was honoured to be able to view an advanced copy, thanks to Graf-Martin Communications, Focus on the Family, and Kindred Image. Each year, hundreds of babies are abandoned on the streets of Seoul, South Korea. Some have been discarded immediately upon birth by young, unwed mothers who can’t face the shame their family will heap upon them. Others have disabilities that the mother feels she just can’t cope with. It’s a staggering and heart breaking reality. We meet a church pastor, Pastor Lee Jong-rak and his family to hear about how his deeply caring heart is saving lives. Because of the shame attached to most of the circumstances around the birth and subsequent abandoning of these babies – he knew that if he could have a way that a child could be safely brought to his home, while keeping the anonymity of the mother, he might just be able to save lives. 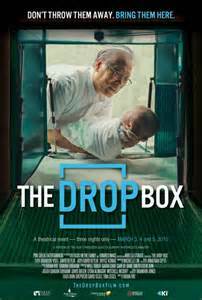 A dropbox was installed at their home. It has an alarm wired, so that when an infant is placed inside it, the whole house is alerted, and his son’s description of what it does to the family is poignant. Pastor Lee and his wife have two natural children, but they have adopted 15 of the hundreds of children that have come to them, each with their own challenges, and each whom have come through the dropbox. I am not a documentary fan, nor do I enjoy films with sub-titles – as much of this film has. However, the story is so compelling, that I was completely drawn in, and soon forgot that I was reading the dialogue. The commitment to the children that Pastor Lee, his family and the troop of volunteers have is inspiring, and challenging. Theirs is a story of inspiration and well deserving to be heard and seen. Pastor Lee and the filmmakers bring a voice to those who have none, and put faces to those that society would have forgotten. If you are able to get to a theatre March 4th or 5th, take time to see this fine movie.